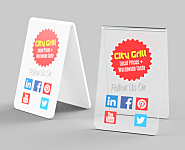 Below you will find some of our most popular designs for Acrylic & PVC table tents with full color printing. 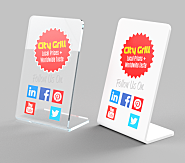 Please download the free table tent templates to change the artwork to your design. We recommend 0.118" clear acrylic which is very sturdy, and screams "quality". 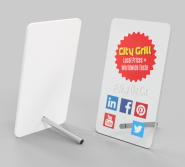 If you are on a budget then the white PVC Sintra is a good option. The PVC Sintra us also more flexible and durable.